← Does some Christian theology invoke a curse? Our Baby is Alive and Well!!! Our Baby is Alive and Well! 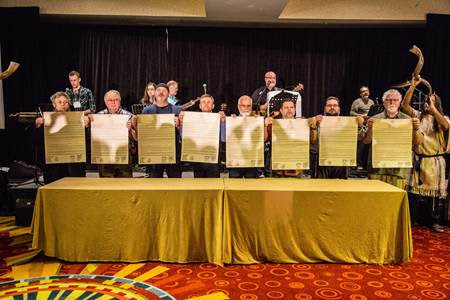 B’ney Yosef North America Elders with the Articles of Declaration at the signing ceremony, March 6, 2016. The task consuming much of the attention of BYNA’s leadership is organizing this continental structure. Our two governing bodies, the Council of Elders and the Executive Council, are meeting regularly and taking on the kind of issues one might expect. As our spiritual oversight, the Elders are weighing BYNA’s identity, mission, and actions against the standards of Torah as taught by Moses, explained by the prophets and apostles, and lived by Messiah Yeshua. This includes prayerfully considering the correct response to criticism leveled at BYNA from various sources. Much of the criticism of such things as the Articles of Declaration, our leadership structure, and even BYNA’s existence, has come from well-meaning fellow Ephraimites who are expressing an understandable skepticism. Answering their concerns is a high priority, and our Elders are the ones charged with that responsibility. What they do now will set precedents and lay foundations on which BYNA will stand or fall, and for that reason they require time, space, and much prayer support. The Executive Council is also laying foundations in the areas of organization and administration. The first major item of business is the expansion of the Council with the addition of Cindy Wyant as our Commerce Director. This expansion had been suggested before the BYNA Summit in St. Petersburg, but it was not possible to move forward with it until afterward. Cindy will oversee the efforts of BYNA at establishing chambers of commerce and other mechanisms by which our people can begin doing business with one another and build out national identity through economic activity. To continue reading this update…. My quick notes: Just like a baby, you can’t see much growth on the outside, but we have been working very hard… Long hours after normal work days. My family has been most patient and I bless them!! Much, much is happening, though! Time will reveal much that we are very excited about as things are developing! This entry was posted in B'ney Yosef North America and tagged Akpene Torku, Al McCarn, Articles, baby, commerce, diapers, growth, Summit. Bookmark the permalink. 1 Response to Our Baby is Alive and Well!! !